Alumni, friends, parents, faculty, students and corporate partners of Kansas State University made philanthropic gifts, pledges and future commitments totaling $152 million in the fiscal year that ended June 30, 2013. This figure sets a new record in total gift activity in the 69-year history of the KSU Foundation, surpassing the previous record of $111 million in fiscal year 2012. Total gift activity includes outright gifts of cash or securities, pledges that will come to the university within a five-year-period, and deferred gift commitments that will be realized by the university at some point in the future. 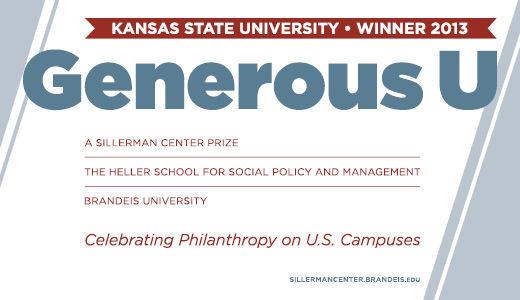 Kansas State University has been named “Generous U” for its student philanthropy, K-State Proud, by the Sillerman Center for the Advancement of Philanthropy at Brandeis University. Are you on Facebook? Do you tweet? If so, you can help us extend K-State’s culture of philanthropy into the social media realm. Like us on Facebook, follow us on Twitter, or connect with us on LinkedIn, but above all — share the good news! We are constantly posting the latest K-State news relevant to giving and progress toward our K-State 2025 goals. From features on our generous donors to stories about inspiring K-State students, social media is helping K-Staters around the world remain connected to what’s happening at K-State today.